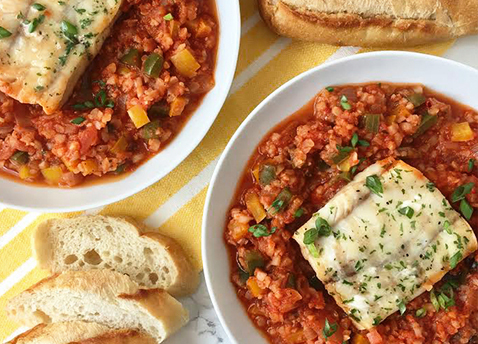 With this flavor-packed Seafood Jambalaya from My Skinny Sweet Tooth, the only thing you’ll go light on is the calories. Proof that treating yourself and watching what you eat can definitely go hand-in-hand. In a skillet on medium heat, spray with nonstick spray and add the onion and peppers. Cook for 5-8 minutes until onions are just translucent and the peppers are starting to soften. Meanwhile, pour crushed tomatoes into a bowl and add cajun/jambalaya seasoning. Mix well. Add hot sauce if using and season with salt to taste (if needed). Add minced garlic to the onion/peppers and cook for 30 seconds or until fragrant. Add the cauliflower rice. Mix everything together and cook for a few minutes to soften the cauliflower. Pour in the crushed tomatoes and stir to combine. 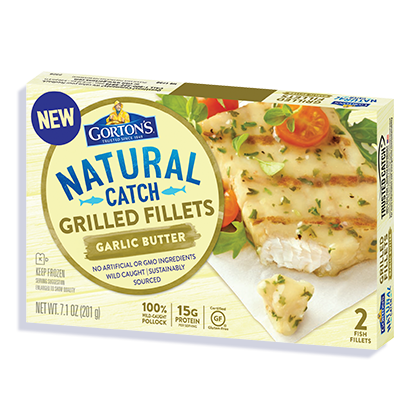 Place the 2 Gorton’s Garlic Butter Pollock fillets on top of the rice mixture. Cover and cook for 10 minutes or until fillets are heated through. Garnish with scallions and additional hot sauce if desired.